House Plan 86104 is a lovely Cape Cod in style, a throwback to homes in England. Three shuttered, symmetrical dormer windows crown a steeply pitched roof- the original design meant for shedding heavy snowfall during long winters in New England. Elegant columns grace a covered font porch measuring 37 feet wide and 9 feet deep. Such a friendly exterior nods to warmth and comfort inside. As you can see in these photographs, this newly constructed home has been finished with sunny yellow walls, white window and door frames and light wooden floors. 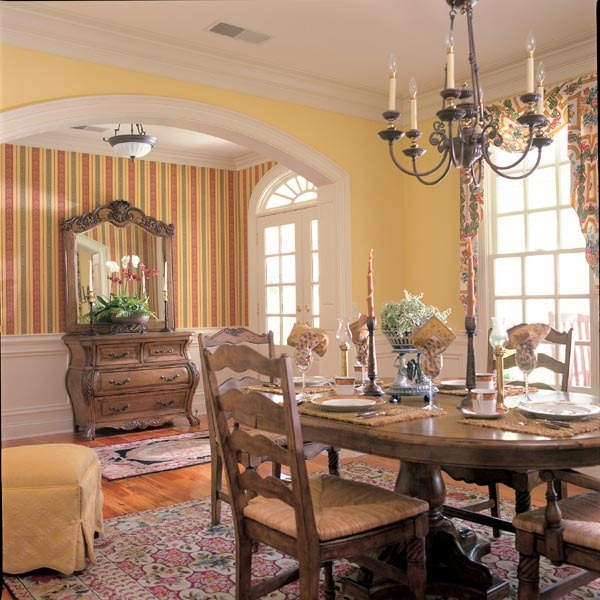 Through an open, arched passage, you will encounter a formal dining room that can accommodate a large crowd during holiday meals. Picture yourself standing at the head of this table, preparing to carve the Thanksgiving turkey for dear friends and family. Daytime meals are enhanced with sunlight from abundant windows, including the fanlight above the front door, and in the evening, enjoy ambient lighting from the iron chandelier. 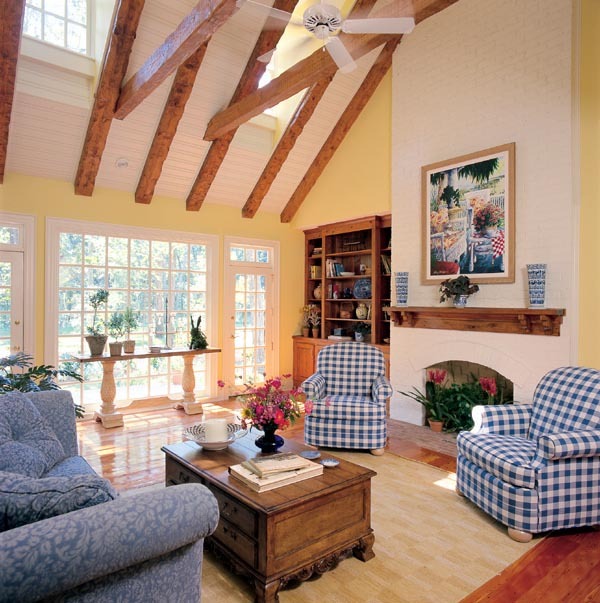 Old world charm is achieved in the great room with exposed beams and vaulted ceiling. A built-in wooden entertainment center and mantle match the rustic timbers. Hang your favorite piece of art on the fireplace- it will be enhanced by the natural light coming in from the dormer windows and the “wall” of glass created by an extra-large window between double doors. Also sharing this view of the back garden is the breakfast nook which is nestled into a bay window for a 180 degree look at the outdoors. This intimate space provides access to a staircase that leads up to a full bathroom and a bedroom with walk-in closet. The recreation room could be used as a library, media room or billiards room, whatever your family prefers. Bedroom space is predominately downstairs with the master suite on one side and the smaller bedrooms separated by the living space. The master suite boasts a double vanity, whirlpool tub, shower, linen closet and his and her walk-in closet measuring 7 feet by 8 feet. The laundry room is right down the hall and includes a sink and drip/dry nook. Bedrooms two and three share the guest bathroom, and each younger family member can claim their own sink. Being of incisive line, thought, style and effect, the understated appeal of this home is reminiscent of a simpler life. Times when neighbor greeted neighbor, doors were left unlocked, and a helping hand was near. Choose your neighborhood, plan your home- you’ve made a wise decision. Click here to view the floor plans and additional interior photographs.